Our Recruiters are not incentivised by commission, they are rewarded by the quality of the work they do, with strong client relationships and a publicly-visible client rating system. We charge an hourly rate, and get the job done right, which works out to better hires at a fraction of the usual cost. We have a wide range of consultants across New Zealand with networks, knowledge and expertise in your niche. Approve timesheets and job adverts with a click of a button. Receive real-time updates on your online dashboard keeping you informed with the project’s progress as you go. Dig deeper into the candidate data and monitor your spend, cost-per-hire, and rate your Consultants all from a single platform. "JOYN have been great to deal with. They helped us get 2 new qualified staff members within 3 weeks of using them. What is even better, is the fact they were half of the cost of a normal recruitment agency. Good communication and great support"
"JOYN have been unbelievably helpful when we requested recruitment assistance. What began as one assignment quickly developed into a full relationship with now over 50 placements and counting. These guys go over and above and are always my first option when we have a search and source need"
"I think JOYN is an awesome tool for recruitment, I am very impressed with the straight forward approach Dee applies, she absolutely nailed it, and the reflection on the dashboard is excellent." 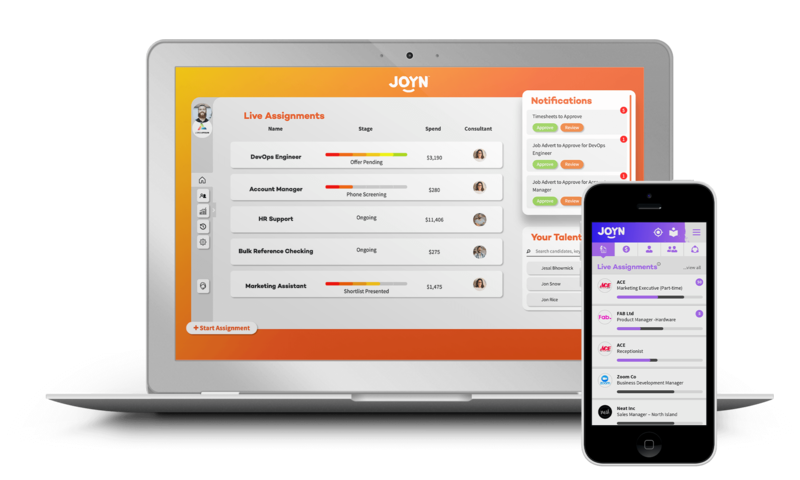 "Working with JOYN has been one of the most painless and fruitful recruitment experiences we have had at Onceit. I believe the value and efficiency the team offer will massively disrupt the market." "Convenient. Great resources. Quick process." "Far Better value than placing through an agency. Both of the recruiters I've used were very professional and instilled confidence that they could manage our recruitment process efficiently"
If you are an experienced recruiter or HR Consultant looking for flexible work, we offer you the perfect opportunity.